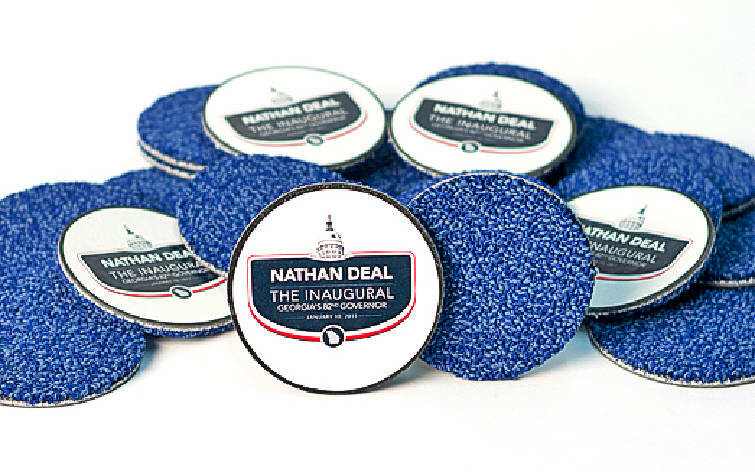 Carpet coasters from North Georgia will be distributed Monday during inauguration events in Atlanta for Gov.-elect Nathan Deal. As Nathan Deal celebrates taking over the governor's office, a tribute to Dalton and Northwest Georgia will be right under his toes. Mohawk and J&J Industries are sending rugs and carpet coasters to Atlanta for Deal's inaugural celebration Monday. Harris Blackwood, a spokesman for the Deal inauguration, said plenty of Georgia products will be used and on display at the celebration, everything from poultry and peanuts to Coca-Cola. "It is really inclusive to all parts of Georgia, but we wanted to be sure we didn't leave out our friends in the carpet industry," he said. "We wanted them to be showcased a little bit. We know what a vital industry that is to the state of Georgia." Deal's swearing-in ceremony is scheduled to begin at 2 p.m. Monday on the Capitol steps, followed by a celebration at Phillips Arena. Blackwood said the coasters -- made of blue carpet on one side and the inaugural seal on the other -- and some rugs would be given away to guests. Other rugs will be used in the various events of the day. Sen.-elect Charlie Bethel, R-Dalton, serves as director of corporate affairs for carpetmaker J&J. He said the company donated the carpet for the giveaway coasters after Deal's staff contacted the Dalton-Whitfield Chamber of Commerce. Gov.-elect Nathan Deal says his inauguration ceremony will happen on Monday, come rain, sleet or snow. North Georgia could be in for snow and ice beginning Sunday night, which could affect Georgians headed to Atlanta for the inauguration festivities. Deal's swearing-in ceremony as the state's 82nd governor is scheduled to begin at 2 p.m. Monday on the Capitol steps. Deal is urging ticketholders to travel with caution on Monday, and he says the swearing-in will be held in the House chamber if the ceremony must be moved inside. The Deal inaugural team will determine whether to move the ceremony by Sunday at 1 p.m. and announce the plan through the media, his website, social networking and automated telephone calls. Georgia Public Broadcasting is scheduled to air the ceremony live statewide. The Chamber reached out to J&J, Mohawk and the Carpet and Rug Institute. "It's certainly a point of pride that our new governor would choose to highlight this area and the carpet industry," said Bethel, who plans to be in Atlanta for the events. Raj Kapur, part owner of Dalton-based Marketing Alliance Group, worked with Brown Industries and J&J to assemble the coasters. He said he was glad to get a nod from the governor. "Carpet manufacturing is a substantial industry in Georgia, and Dalton has been called the carpet capital of the world, so there's the pride aspect," he said. Dalton Mayor David Pennington said including carpet was a nice gesture, and he predicted Deal would be more manufacturing-friendly than his predecessor Sonny Perdue. "The new governor, I think, understands the importance of manufacturing and the carpet industry," he said. Contact staff writer Andy Johns at ajohns@timesfreepress.com or call 423-757-6324.